The second-best time to act against climate change is now; the best has already passed. It´s the moment to foster emissions reduction, effective carbon prices, key partnership and climate risk management. At the Paris climate conference, ACCIONA took a step forward in its decarbonization commitment by undertaking to be a carbon-neutral company from 2016. In addition to its efforts to reduce GHG emissions in accordance with the Paris Agreement, each year the company offsets the net balance of emissions from its activities using Clean Development Mechanism (CDM) certificates recognized by the UN. In this way, the company offsets its entire impact on global warming while contributing to the creation of an effective market in emissions certificates as an essential tool for decarbonizing the world. ACCIONA participates in the development of projects to fight climate change, with eight projects in Mexico, India, Chile and Costa Rica registered in the Clean Development Mechanism (CDM). The company also participates in the voluntary carbon market through the Verified Carbon Standard (VCS) program, with two wind projects in US. The company avoided the emission of 14.4 million tons of CO2 in 2017 thanks to generating electricity exclusively from renewable sources. Its business activity produced 1.2 million tons of emissions, which the company offset within its carbon neutrality policy while reducing its energy intensity (energy consumption per million euros of revenues) from 2.68 TJ to 2.63 TJ. Renewable energy and sustainable infrastructure company, ACCIONA, commits to reduce absolute scope 1 and 2 GHG emissions 16% by 2030 from a 2017base-year. - 2050 Pathways to Prosperity and Safe Climate initiative. 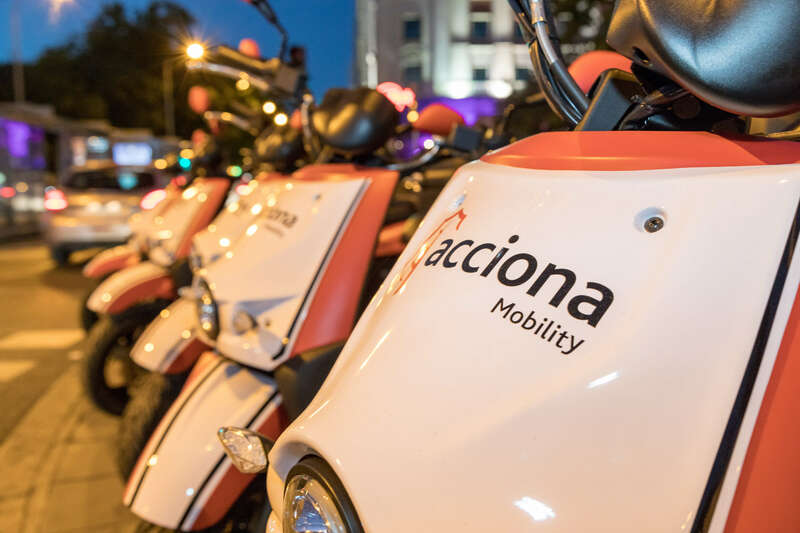 ACCIONA has stepped up to the challenge of sustainable mobility with ACCIONA Mobility, which launched a scooter sharing service in Madrid (Spain) in October 2018. ACCIONA's incursion into the vehicle sharing business is in line with the company's mission to support sustainable solutions linked to infrastructure, specifically transport. Vehicle sharing services are aligned with ACCIONA's wish to contribute to reducing CO2 emissions, improving the quality of life in cities, electrifying the economy and promoting alternative means of transport. For this reason, ACCIONA is moving into this market under its own brand in order to deal directly with end users of transport services. The company is deploying a fleet of over 1,000 electric scooters, charged with electricity that is certified 100% renewable; users pay per second of actual use, which optimizes the economic advantages of using a shared vehicle. The service app will inform users about the CO2 emissions they avoid by using a 100%-renewable electric scooter instead of a conventional private vehicle. The scooters, which will be geolocated, have the equivalent power of a 125 cc engine and, as a novelty, offer two riding modes: Standard ("S"), with speeds of up to 50 km/h, for use in the city; and Custom ("C"), which can reach speeds up to 80 km/h, for highway use. The scooters are all two-seaters and carry two helmets in their trunk.